Geographic Expeditions is a professional travel management corporation, which provides a broad range of travel and location management services for individuals, travel agents and corporations. It also supplies an array of location and marketing support services and specializes in remote locations and complex logistics. The company has operations throughout Africa, Asia, Europe, Latin America and the Pacific. Geographic Expeditions was organized in 1981 (as InnerAsia Expeditions) to develop and operate specialized travel programs in central Asia. It was the first American company to negotiate protocols with the Chinese government to operate treks into Tibet and western China. Nepal, India and Bhutan were added soon thereafter. It has pioneered travel in Tibet, Bhutan, Mongolia, Vietnam, Burma, Patagonia and remote sections of the former Soviet Union. Over the years, Geographic has expanded from its Central Asian roots to the rest of the world. Currently the company provides travel services for approximately 4,500 passengers a year. Geographic has acted as tourism development consultants to numerous governments and non-governmental organizations. Another expanding and significant area of Geographic's services is location consultation and management for a grand variety of companies such as ABC Television, Boeing, Sotheby's, the Walt Disney Company, ESPN, the BBC, Travel and Leisure, the National Geographic Society, Fox Broadcasting, HarperCollins, and CBS Television. The company also arranges special interest trips for a variety of non-profit organizations such as: the American Museum of Natural History, the Audubon Society, Stanford Alumni Association, the Tibet House, World Monuments Fund, the University of Chicago, Houston Museum of Science, Harvard's Museum of Comparative Zoology Outward Bound, the California Culinary Academy, the Boston Symphony Orchestra, the Nature Conservancy and many, many more. 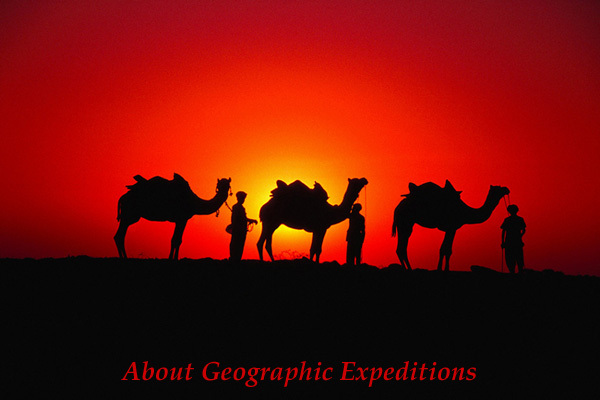 The staff of Geographic Expeditions is dedicated to preserving the character of the lands and cultures they visit. They invite you to call them for a description of the steps they are taking to promote environmental and cultural preservation.